We are all prone to “faking” something – pretending we’re happy when we’re not, pretending we know more than we do; we fake emotions and we fake behaviors. But God calls us to be real with him and with other people. InterVarsity’s new proxe station, “Faking It”, is a provocative interactive display to use on campus. 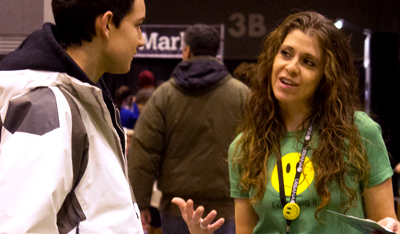 The station leads students through four panels, each one asking them to explore a different aspect of Faking It – how they see others faking it, how they fake it, what Jesus has to say about faking it and what it means to be real, and ultimately leading them to a gospel presentation. Panel 1: Our Campus Panel 2: Mood Panel 3: Luke Panel 4: Four Circles SIZE: 30"x 40" ($60) priced per four panel set. SIZE: 30’’x 40’’($60) priced per four panel set. TO ORDER: Staff Store. Email graphics@intervarsity.org with specific customizations, early orders. your own .pdfs,.jpgs, .png, .ai, .eps, etc. Join the Fake proxe discussion on Facebook. Fake Poster Blank: 11 by 17 in. Fake Poster Blank: 8 1/2 by 11 in.